The Royal Tyrrell Museum opened the Ice Ages Gallery in 1999. 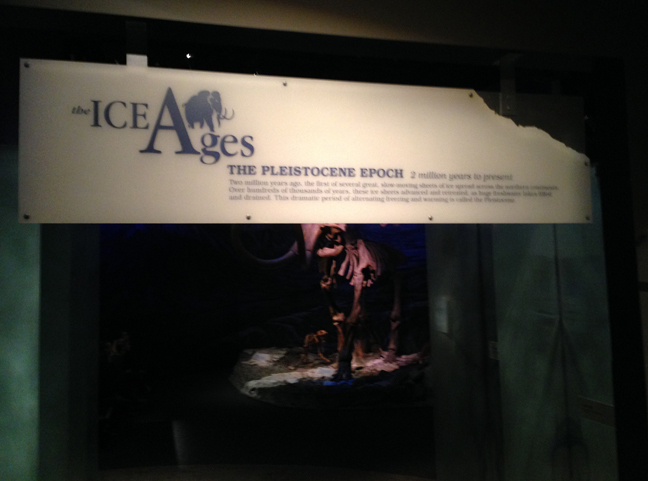 A collaboration between curators, technical staff, the exhibits team and others, it tells the story of Alberta from two million years ago to the present—the time called the Pleistocene, when huge mammals roamed, great ice sheets came and went, and humans first arrived in North America. I prepared the text for the panels and labels. Browse through the image gallery below for a view of gallery displays and signage. To read the signage, click on the image. Glacial ice and meltwater shaped the landscape and affected the climate. A patchwork of grassland, parkland and other habitats developed, known as the Mammoth Steppe. Resembling a cold version of Africa’s savanna, the steppe environment allowed mammoths and other herbivores to flourish. Represented here by a mother and her calf, the American mastodon inhabited forested areas and lacked the grazing adaptation of its larger relative, the mammoth. Low-crested teeth indicate it browsed softer vegetation. The Pleistocene is known for big mammals. Ground sloths as tall as African elephants. Giant bison with horns that panned more than two metres. The modern bison roamed the plains of North America in vast herds. As the mainstay of the region’s first people, they were hunted for food, clothing and shelter. Now, bones and few rubbing stones are all that remain of their existence. Why did the incredible diversity of Pleistocene fauna disappear? Were Ice Age animals so specialized, they couldn’t adjust to changing environments after the last glaciation? Did humans wipe out entire populations with their weapons and hunting techniques? Did animals migrating from Asia outcompete North American species? Did animals entering North America bring new, deadly diseases? Or, was it a combination of factors that led to the Great Extinction? Dying out over 20,000 years ago, the giant bison may have been solitary browsers and grazers of open woodlands. Larger than their modern relatives, their horns were more than three times the size of horns on today’s buffalo. The span of the ancient horn cores indicates the extreme length of the horns. The prairie dogs that lived in these fossilized burrows 22,000 to 33,000 years ago were the largest known—some 15% bigger than modern descendants like the one in this photo. The grasslands of Ice Age Alberta supported a greater diversity and abundance of animals than today’s African savanna. Rhinoceroses, camels and donkey-like horses lived alongside lions, cheetahs, bears, beavers, mammoths and mastodons. A relative of the modern tree sloth, the ground sloth migrated from South America. This species is small compared to other ground sloths—some were as large as African elephants. The extinct dire wolf howls at the end of the Pleistocene. A close cousin to the timber wolf, dire wolves lived in packs and hunted large herbivores such as horses and bison. With the introduction of new species to North America came a new predator. Humans quickly spread from Asia through North and South America. Using stone and bone tools and weapons, they thrived in these rich hunting grounds and may have caused the extinction of many large Pleistocene animals.